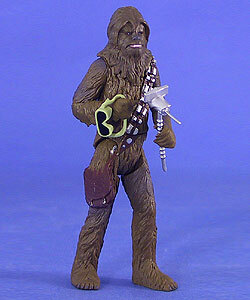 Note: This figure is the same Chewbacca (Millennium Falcon Mechanic) figure that was previously released in the 2000 power of the Jedi line. Comments: Loyal even at a great personal risk, strong as a gladiator, and as technically savvy as the brightest Academy graduate, the two meters plus Chewbacca is a true hero of the rebellion. Chewbacca is copilot aboard the Millennium Falcon, where his skill as a mechanic proves invaluable to the safety of the ship and its crew. As the Imperial forces attack the Rebel base on Hoth. Chewbacca works feverishly to make repairs to the Falcon in time to escape the arriving snowtroopers.